Are we really on the cusp of détente with Iran? Conventional wisdom seems to think so and it would be fair to say that outreach toward Iran has become the centerpiece of the Obama administration's foreign-policy legacy. But as Iran's leadership engages with the West, behind the scenes they are putting the gas on a plan for world influence that threatens Western interests and security at every corner of the globe. Iran's Deadly Ambition shows how, in our eagerness to conclude the nuclear deal, the United States has missed the big picture and turned a blind eye to the Islamic Republic's fomentation of international terrorism, its support of genocidal rogue states, its continued domestic repression, and other actions that prove Iranian leadership still views itself at war with America and the West. This past April, commenting on the pending nuclear agreement with Iran, President Obama expressed his hope that the nuclear deal would serve as a vehicle for the Islamic Republic to at long last shed its international pariah status and "rejoin the community of nations." 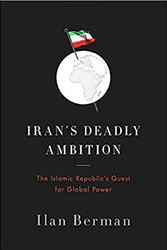 But Iran's Deadly Ambition shows that our government's rush to appease demonstrates a naive misreading of Iran's revolutionary ideology, rewards Iran's ayatollahs and emboldens their hegemonic objectives, and defers rather than averts the West's nuclear nightmare.